Oh the "Fall Season", with the cool, crisp evening air and the colorful fall palette. The "Falling Leaves" Collection is a beautiful mini collection that brings all those senses into play. The collection has 30 designs in three formats: small, medium and running stitch. 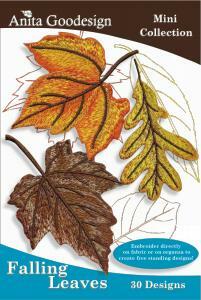 You can embroider directly on fabric or on organza to create freestanding leaf designs. As you can see from our table runner sample we combined all three formats to create a visually interesting motif. The possibilities are endless such as table runners, place mats and towel sets. Or... you can take your embroidery a step further and add a combination of all thee formats to a linen shirt. How stunning would that be?